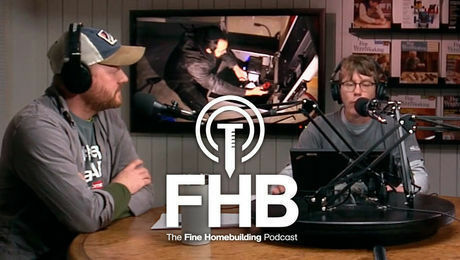 Synopsis: Building-science consultant Michael Maines defines a rainscreen as a system of materials used to create a gap between the siding and the water-resistive barrier, and gives an in-depth explanation of what rainscreens to use for different purposes and getting rainscreen details right. Of all the advances in building science over the last 25 years—new technologies, products, and approaches to building safe, durable houses—perhaps the simplest and most versatile is the ventilated rainscreen. I first learned of rainscreens in Fine Homebuilding issue #137, published in 2001. They seemed simple and logical. 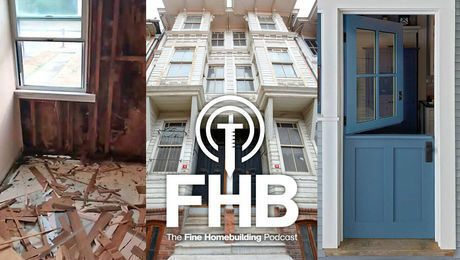 With input from Dr. Joseph Lstiburek of Building Science corporation, author Mark Averill Snyder explained how a rainscreen can help address peeling paint on siding, and he shared details on how to do it. More than 18 years later, rainscreens are common on high-performance buildings— even required by code in a few places—yet many builders turn instead to “low-maintenance” synthetic cladding systems. These systems can do damage to the underlying structure, and they often cost more than traditional natural materials. They also come with a higher carbon footprint than those from renewable resources. Other builders use natural materials but omit a rainscreen, which can lead to premature failure. A rainscreen is a system of materials used to create a gap between the siding and the water- resistive barrier (WRB). It helps keep the entire wall assembly dry by allowing for both water drainage and airflow. You might ask, Isn’t that the job of the siding? Yes and no. Virtually all common siding systems will leak at some point, especially when subjected to wind-driven rain. A rainscreen enables water to drain away from the structure. Because many siding materials—including wood, fiber cement, stucco, masonry, and concrete—can absorb water, they are considered reservoir claddings, which means they benefit from being able to dry on the back side, as do the sheathing and the rest of the wall assembly. In cold climates, rainscreens allow walls to dry without compromising the integrity of the siding or its finish, and in hot climates they can assist with cooling. Rainscreens also create a zone of lower pressure differential compared to the exterior, which reduces the force of windblown rain. With a gap of 1⁄16 in. or less, even the thinnest rainscreens— sometimes called “drainscreens” because they don’t allow for airflow—are still effective. 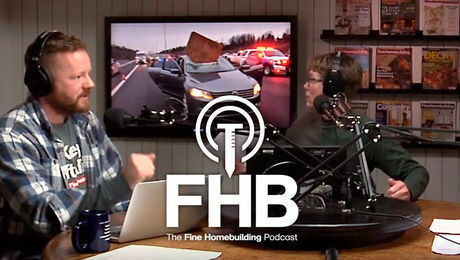 Martin Holladay, editor of GreenBuildingAdvisor.com, describes the two types of drainscreen products as “wrinkled” and “bumpy.” A common wrinkled wrap is DuPont’s Tyvek DrainWrap. With its shallow vertical drainage channels, it looks a lot like regular Tyvek housewrap in need of ironing. The bumpy wrap that I see most often is Benjamin Obdyke’s HydroGap, which is a standard WRB covered in closely spaced plastic nubbins. In his 2011 article “Building Science Digest-013: Rain control in Buildings,” building scientist John Straube discusses how even thin gaps can allow water to drain. But, he notes, they are not deep enough to also provide airflow or block capillary water movement. I think they are best used in low-risk situations such as relatively dry climates or unheated buildings. To break capillarity, which can move water to places you don’t want it, Straube recommends the gap be at least 1⁄4 in., though he says 3⁄8 in. is safer. According to Straube, the wetter and colder the climate zone and the more water the cladding is capable of absorbing, the thicker the rainscreen should be. So-called vented rainscreens are open only at the bottom to allow for some airflow, which helps accelerate drying before problems caused by trapped moisture can occur. But for improved drying, the best rainscreens, ventilated rainscreens,include openings at both the top and bottom of the wall. The two most common methods for creating either vented or ventilated rainscreens are plastic mesh mats and rainscreen strips. Plastic mesh mats like Benjamin Obdyke’s Slicker Classic, which is available in various thicknesses, work well under some siding types, particularly wood shingles. Thicker versions such as Obdyke’s Slicker Max and Mortairvent by Advanced Building Products, are great for keeping mortar from clogging the required gap behind brick cladding. But because they are compressible, they can make it tricky to install some types of siding. The other common option, rainscreen strips, can be made of wood, plastic, or metal. If you are installing horizontal siding, use vertical rainscreen strips under it; with vertical board siding, use horizontal rainscreen strips. note that shingle siding can be installed over horizontal strips. Several commercially available rainscreen strips—including Cor-A-Vent’s Sturdi-Batten, which is made of polypropylene, and the aluminum Roll-On Rainscreen and steel FM3-VHV (both by Advanced Rainscreen Furring)—have gaps so they will drain even when installed horizontally. The other option is to install the rainscreen strips on an angle to allow both horizontal nailing and vertical drainage as well as airflow. Wood rainscreen strips do not need to be pressure treated or otherwise rot resistant. The little bit of water they may come in contact with will evaporate quickly—that’s one of the main reasons to use a rainscreen. In climate zones 5A and 6A, if I am putting horizontal siding over solid sheathing, I often spec 1⁄2-in. CDX plywood ripped into strips because it is cost-effective and durable, and I have found that OSB swells too much. 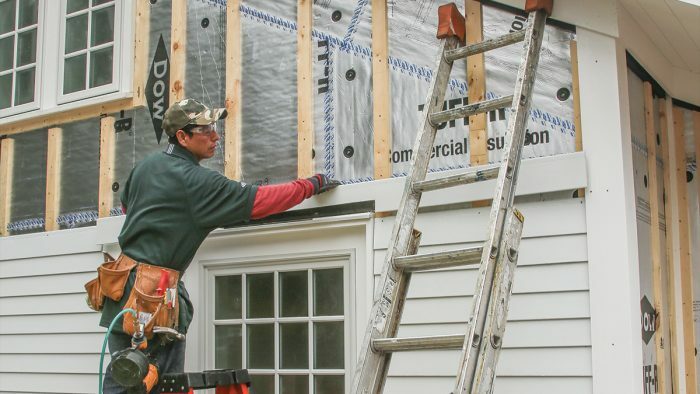 When the siding is going to be installed over continuous exterior insulation, the furring strips used to attach the insulation double as a rainscreen, but CDX strips aren’t stiff enough—nor are any of the commercially available products. I spec 1×3 boards, which are called strapping here in the northeast. 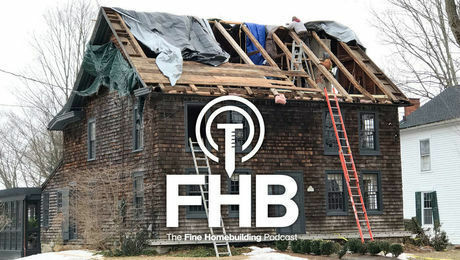 Some builders prefer to use thicker material, but most will say that 1x lumber is stiff enough if the right care is taken when fastening the strips. Robust rainscreens are good in damp climates for easy drying. In cold climates, they ensure moisture moves from the interior to the exterior wall without affecting siding finishes. And in hot climates, the venting channel at the top creates a chimney effect for exhausting hot air before it enters the building. Some builders take it one step further, creating what carpenter John Deans at emerald Builders refers to as the “basket house” approach for its resemblance to woven wicker. It calls for two full layers of 1x strapping to ensure that no siding fasteners penetrate the WRB or the airtight layer, which is often at the sheathing. Though the first layer of strapping does penetrate the WRB, the holes are safe behind the strapping. Reggie Lebel, owner of emerald Builders, used this approach recently on a project I designed. It reached an extremely tight blower-door test of 0.125 ACH50. 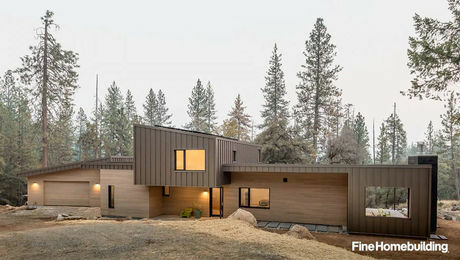 Another company, ecocor, builds panelized Passive Houses using a similar approach (see “Making Passive House Mainstream,” FHB #270), and always tests below 0.40 ACH50. 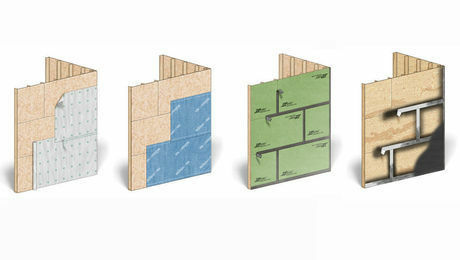 In most cases, flashing should extend behind the WRB, not to the outer face of the rainscreen strips. In fire-prone areas, check with your code official—sometimes thicker rainscreen gaps are not allowed due to their chimney effect, or they may need to be blocked at the top. Combustible exterior insulation might be forbidden, too. To keep pests out, use window screening—preferably metal—or a corrugated plastic product like those made by Cor-A-Vent over openings at the top and bottom of the wall. You can also use perforated metal J-bead made for this application. Standard vinyl siding is essentially its own rainscreen because the back is open, which minimizes capillary action, and the panels fit together loosely enough to allow for some airflow, so a separate rainscreen is not necessary. Check the installation instructions on the cladding you intend to use to make sure it’s compatible with your rainscreen system.